So, you got hurt. You got brain-injured. 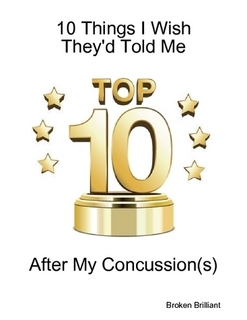 That concussion didn’t clear up the way your doctor said it would, and weeks later, you’re still dealing with sensitivity to light and noise, you’re still overreacting to situations at home and at work. You feel like crap. Seriously. Like a steaming pile of crap. Months pass, and you’re still “not yourself”. You walk around in a seemingly permanent fog, and you just don’t feel like you know yourself anymore. Your family is getting tired of you being different from how you were, and your friends are starting to pull away from you. They keep telling you to “snap out of it!” and they don’t seem to believe you when you say you’re not okay, not able to do the stuff you used to. Things at work aren’t getting any easier, and nothing seems as smooth and effortless as it used to. Day after day, week after week, month after month… it all adds up. It seems like everything has slowed to a crawl… a tedious, infuriating crawl. Nothing makes sense to you, like it used to. You don’t make sense to yourself, the way you used to. You feel like a stranger walking around in a world that used to be so familiar, so friendly, but is now a confusing mass of details that just don’t make any sense at all. When you get up and look at yourself in the mirror, you recognize yourself less and less. There’s a different look in your eye. There’s a different sense about you. You hold your head differently. You don’t have that same confident air that used to be your hallmark. Something is changed. Something is gone. It feels like your Self has a bunch of holes in it, where it used to be solid and familiar. Who the hell are you now? There’s no doubt that traumatic brain injury alters a person. And there’s no arguing with the fact that when some things get damaged, they’re altered for good. We experience life-altering change all the time — for ill and for good. You make a mistake at work, and it gets you in trouble, and you lose your job, which changes your financial condition and sends you down a road of increasing debt and difficulty. You meet someone you instantly connect with, and just after talking to them for a few minutes, you feel your life has actually changed for the better. You become friends, and spending time with them renews your hope and brings you courage. They have literally changed your life — for the better. Our experiences shape our minds and hearts. They shape our brains. So, every single time we experience something Big that makes a durable impact, our brains our changing along with the rest of us. New connections are being created. More chances for change are opening up. Old ideas shift. Old thinking shifts. And we become — however subtly — different people. A different “Us”. Why should that be any different with brain injury? As we’ve come to know, the brain is amazingly plastic – to a degree science is only now beginning to measure and understand. We’ve been that way all along, despite the assertions of scientists who told us otherwise, and for eons (whether or not experts have recognized this), brain-injured individuals have been working their way back to reclaim their places in society. They’ve done it with greater or lesser success. Phineas Gage kept going in society, but he was a very different man (and unfortunately, his is the model that neuroscience seems to use to predict how many other brain injury survivors will turn out). But there are also many people who have experienced brain injuries, myself included, and have battled back to a place of functionality. Some have gotten there sooner, some later, some have recovered to where nobody can tell that they ever had a brain injury, while others seem to never regain their past qualities. But we’re doing it, to some degree or another. Even when we have setbacks, as all people do. Even when we have slip-ups and fall short, or seem to regress, as can happen. Progress continues. New normals shift and morph into other kinds of new normals. And even the most stubborn of conditions can sometimes shift into something different. We’re seeing that now with innovations in exoskeletons for paralyzed people. We’re seeing that now with different kinds of stimulation. And we can witness the most significant of minor miracles in the lives of many who were told to give up by healthcare providers who didn’t have the means to see what else was possible for those people. This is why it’s important to never give up. Because we don’t know the end of the story. We don’t know the limits of the brain. We learn new things every year — sometimes every day, it seems. And at the center of it all, in our own brain injury recovery process, is the Self. Our Sense-Of-Self. Who we know ourselves to be is hugely important to our progress. Who others know us to be is equally so. Who we are becoming is a source of constant discovery. And learning to recognize ourselves, when we look at ourselves in the mirror… or we see ourselves having an experience in life — be it good or ill — is so, so central to making progress, regaining our stability, our solidity, and finding a new path forward. That’s why it’s important to not give up. That’s why it’s important to not let it all go, but to keep going, keep engaging, keep observing yourself and learning to recognize the reactions you’re having. Because it trains us to re-recognize the person we are, as we go through the process of re-learning how to be that person. If we give up, if we give in, we are cutting ourselves off from the chance to learn and grow and get to know ourselves. We’re also not giving others the chance to get to know us as the new person we are, to learn to recognize a predictable pattern of behaviors and reactions. We’re not giving the world the chance to get used to us as the new version we are. So, no. For me — and I hope for many others — there is no letting go, there is no giving up. I make my false starts, I make my mistakes, I learn my lessons, I “take my medicine”. And I keep learning. I keep moving, I keep giving myself time to rest and recuperate. And it’s important that we all do that, after brain injury — TBI — concussion. Give ourselves plenty of time to rest and recuperate, but never actually quit. Never give up. Never give in. Just keep going, keep trying, keep living till you recognize that person in the mirror and the reactions and experiences you’re having in this world. We are all works-in-progress. Unless we stop. Then everything just turns into work.